In our monthly study of the conflicts that lie behind treasured campaign medals, this month, we turn to the India Medal awarded for campaigns fought on the North-West Frontier between 1895 and 1902. 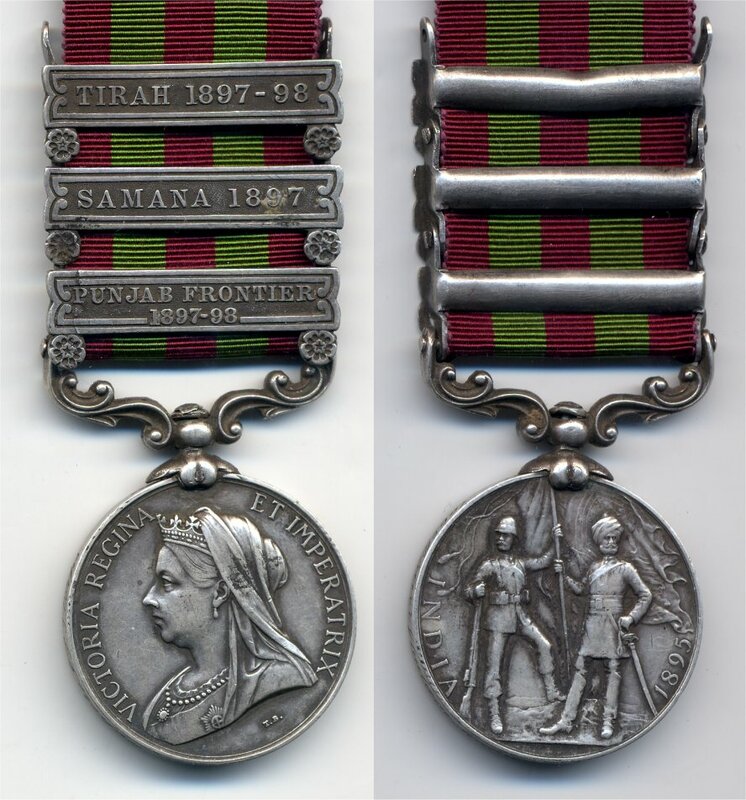 The India Medal, approved in 1896, was issued for a series of campaigns fought on the North-West Frontier of British India. Though the intensity of the fighting varied considerably, the typical pattern was for local risings to prompt the dispatch of an Anglo-Indian column to devastate tribal territory and re-impose peace and order. Sometimes a permanent garrison was installed, sometimes not, depending on circumstances. The problem for the Anglo-Indian forces was that the presence of a garrison might itself invite sustained resistance and impose a considerable logistical burden in exceptionally difficult terrain. The absence of one, on the other hand, left open opportunities for renewed raiding and insurrection. All of these operations were, therefore, first and foremost, retaliatory and punitive, rather than attempts at conquest. The first operation, the Chitral campaign of 1895, can serve as an example. The death of the local Chitrali ruler in 1892 unleashed a struggle for power between rival tribal factions. The British intervened in this struggle in an effort to secure the succession of a compliant ruler. This in turn led to a sharp engagement at Chitral Fort, which ended with an Anglo-Indian force of about 400 troops (with another 200 or so non-combatants) under siege inside the fort from 3 March to 13 April 1895. The fort was a substantial square structure of timber, stone, and mud, with a covered way giving access to the local river, the garrison’s only source of water. The commander of the garrison was Captain Charles Vere Ferrers Townshend. A relief force of 16,000 men under Major-General Sir Robert Cunliffe Low was dispatched to the scene. The major confrontation of the campaign took place at the Malakand Passon 3 April 1895, when the invasion force defeated and drove off a Chitrali force estimated at around 12,000 strong, inflicting around 500 casualties for the loss of about 70. The column then pushed on through the mountains to Chitral Fort, by which time the resistance of the local Pathan tribesmen was effectively over. Total Anglo-Indian casualties in both siege and relief expedition were about 375. The relief force had set out on 7 March, and operations were completed on 15 August. No enduring peace was ever possible across this vast and inaccessible region of warlike mountain tribes with a long tradition of raiding and guerrilla resistance to outside intervention. Between the Second Afghan War (1878-1880) and the Third Afghan War (1919), it is possible to count no less than 26 distinct Anglo-Indian military expeditions on the North-West Frontier. It was, in a sense, one of the British Army’s principal training-grounds throughout this period. How many people get this medal. Anyone belong to bearing family?